Wow June 30th already. It's astonishing how quick this year is going by. Hard to believe Christmas is less than six months away. 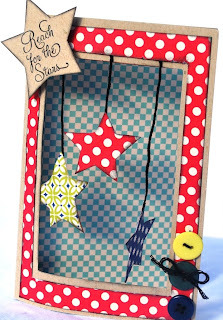 To celebrate Christmas in July the Design Team have put together some lovely Christmas projects to get you inspired. Be sure to check back later this month. Here is a card made using this week's colour combination of Stonewash, Parakeet and Walnut. It's time again for another tutorial. 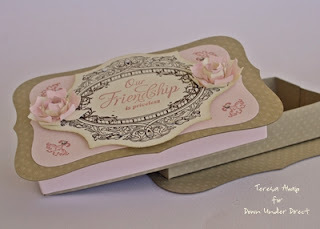 This week I've created a flower using the Spellbinder die-Floral Doily Motifs. To make the two different sized flowers, I've used a combination of the three dies below. For each large flower cut one of each. For each small flower cut two of the smallest. Prepare your "flower layers" by cutting the pieces as shown in the photograph. Using the inking brush and inkpad Dab the edges of each of the"flower layers"
Using the mini Mister, Spritz each of the "flower layers" with water, doing both sides. Let the water soak in for a few seconds, and then scrunch each one up and then very carefully unfold. Dry with your heat tool. 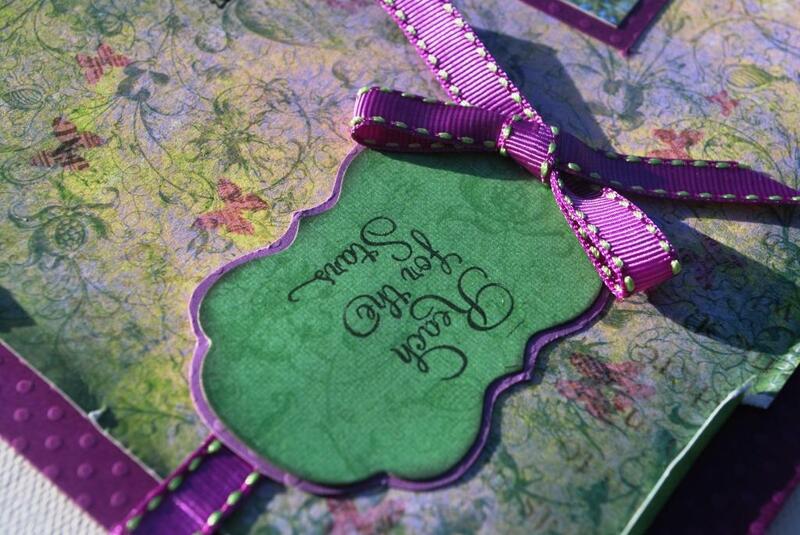 Using an embossing stylus and mouse pad, carefully press the centres of each "flower layer." To assemble stack the layers on top of each other making sure the "petals" are opposing. Secure with adhesive and add a pearl to the centre. This week we have another colour challenge. The featured colours are Stonewash, Parakeet, and Walnut. 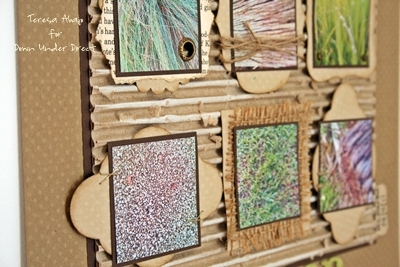 Here is a clever use of various Spellbinder Label Dies to use as backing for small photos. This week's colour combination is Kraft, Admiral, Jade and Pomegranate, a wonderful combination for those Masculine projects. 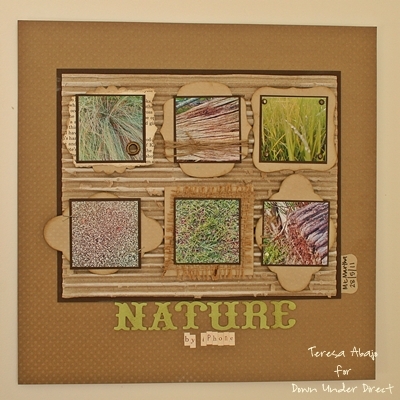 Sue has made wonderful use of the Impressabilites to emboss the individual squares. Here is a lovely card using the Grand Scalloped Squares die as the card base. These large dies are perfect to use folded as a card base or alternately you can place the die with one edge along the fold of your cardstock and cut this way. 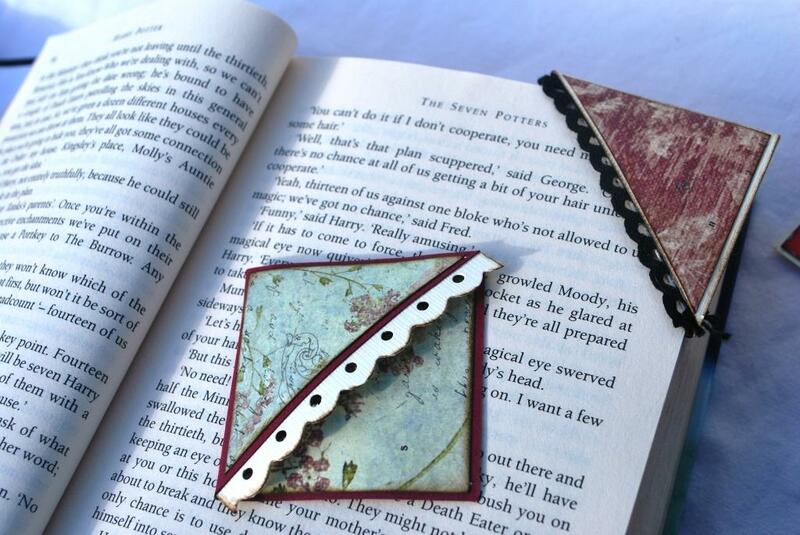 Here is a cute idea for some quick little bookmarks. Here is another pretty card from Sheree. Today I have another card using this week's colour combo of Steel Blue, Raven, Pomegranate and Salt. 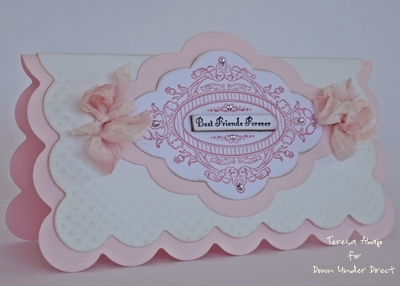 The card is a basic centre step card. 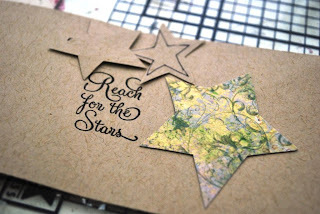 To make the embossed cardstock really stand out, I've rubbed a versamark pad lightly over the surface. This gives a slightly darker shade of the Pomegranate to the raised areas. 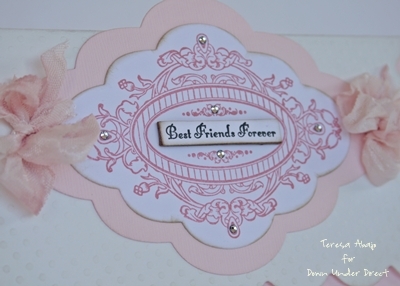 I've embellished the Parisian Accent Die with some Swarovski Crystals, and although it is difficult to see in the photo these really do sparkle. Welcome to another Turorial Tuesday. Today's tutorial from Kirsty, is for a window card with the addition of some "dangly stars." 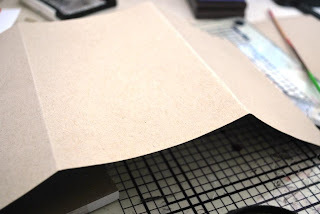 Cut a piece of Kraft CS 6x12 inches. Score this strip every 4 inches and fold into thirds. 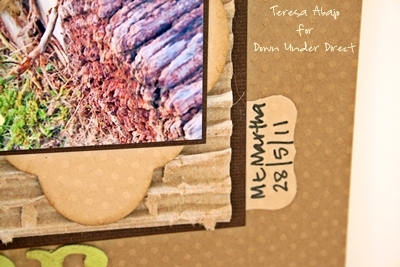 Cut a frame from the front of your card, leaving a border of about 1.5cm. 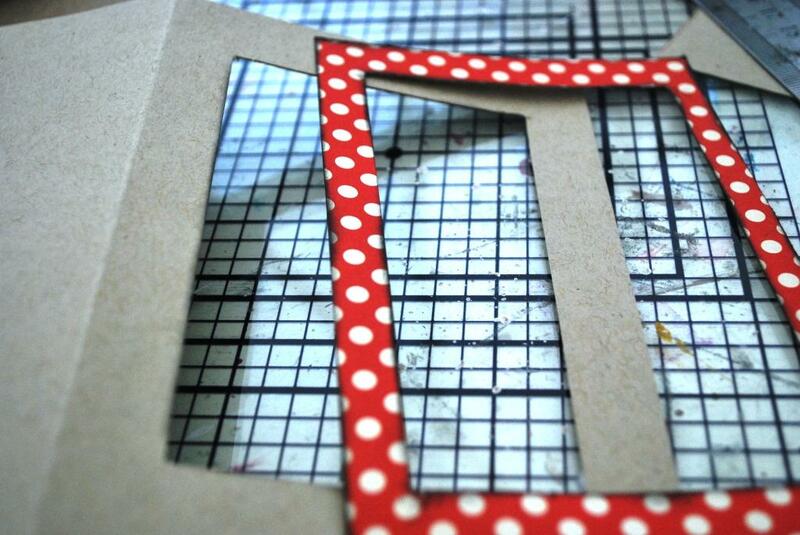 From your patterned paper, cut a rectangular frame as shown with about a 1cm border. 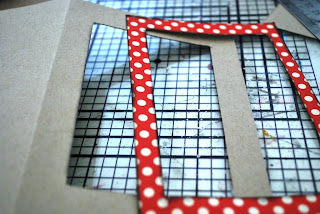 This should fit around the outside of the frame cut into the front of your card. 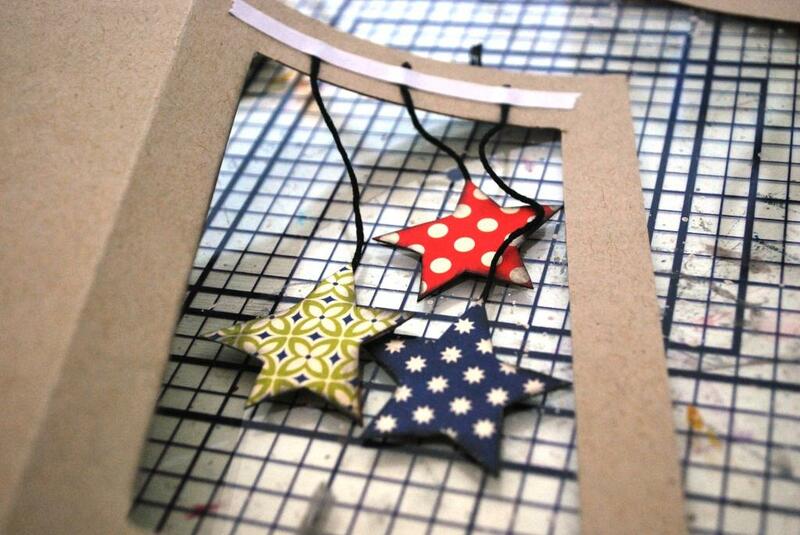 Roughly sketch some stars onto a scrap of card or paper, and use these to cut your dangly stars out. 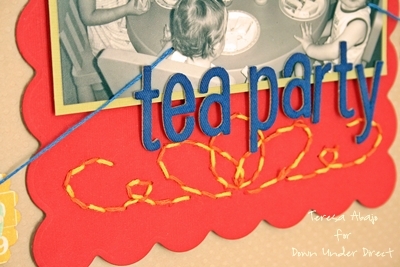 Cut two of each so you can sandwich your embroidery floss between the layers. 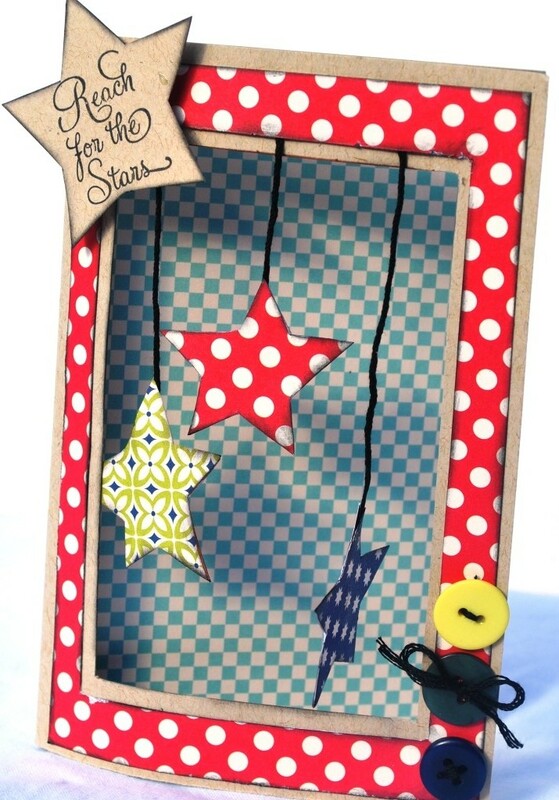 Stamp your JustRite sentiment onto some card, and again sketch then cut out a star around the sentiment. 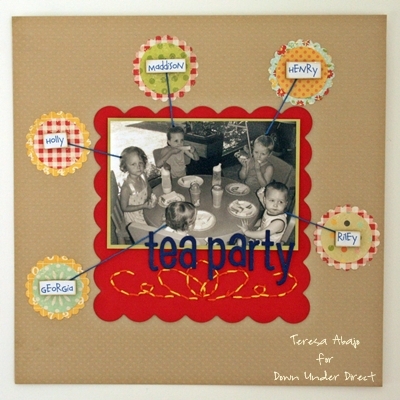 Adhere your patterned paper frame to hide the ends of your embroidery floss, adhere your sentiment to the top left hand corner and some buttons on the bottom right hand corner. 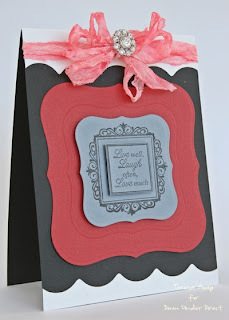 Here is a lovely idea for a box to hold a small gift, or maybe a gift card. 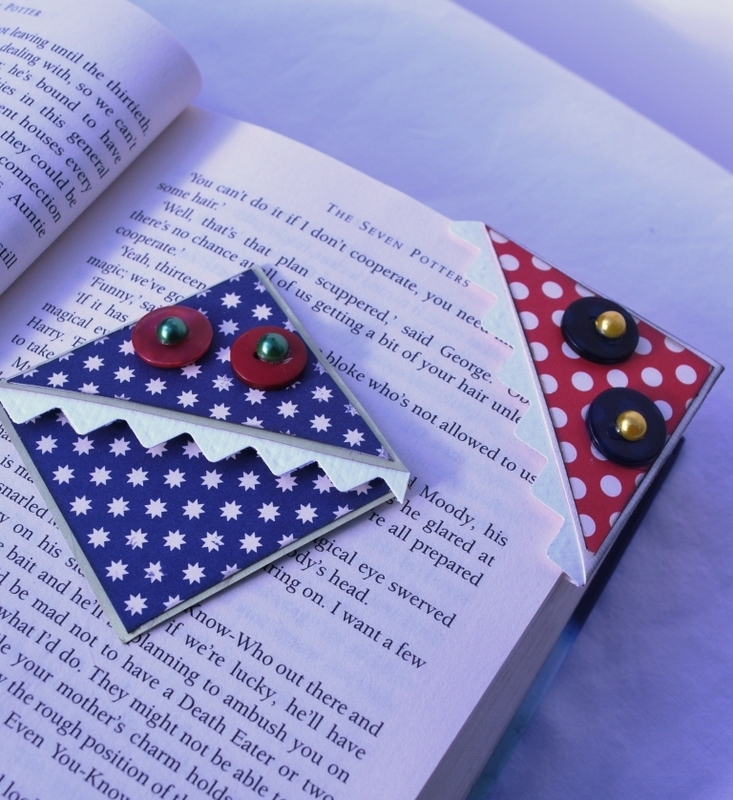 Why not make a matching set of tiny notecards to slip inside. 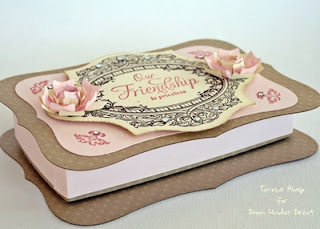 Here is a lovely Gothic style card incorporating several Spellbinder dies. By lightly brushing over the embossed surface with an inkpad, you can really make the pattern stand out. 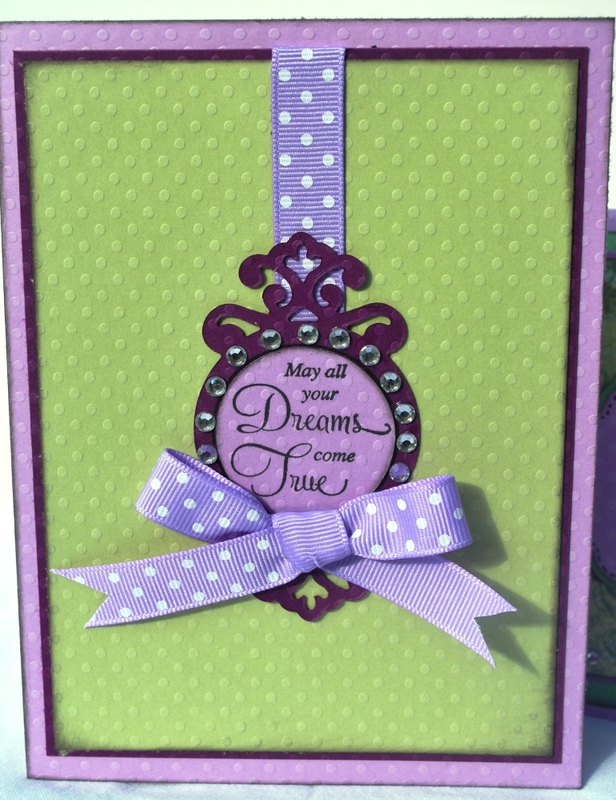 Here is another card using thecolours in this week's colour combo challenge. 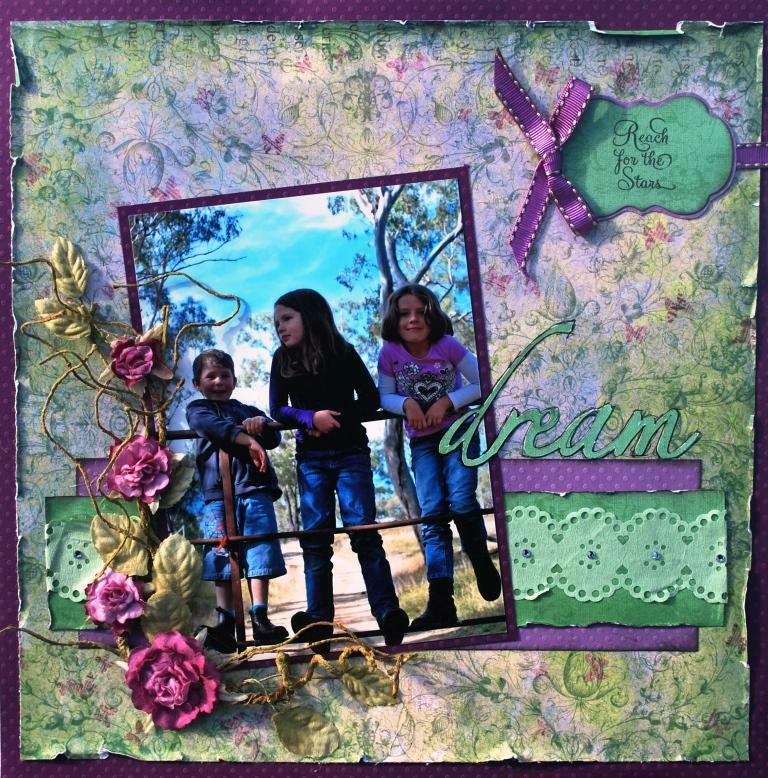 Here is a lovely layout created by Sue. This month I gave each member of the design team a different colour combination to work with. 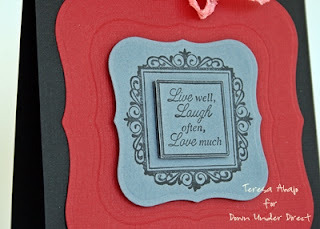 Each week this month we will showcase a couple of projects made with these colour combos. For the first combo we have Kirsty with Celtic Green, Berry Pretty, Grape Jelly and Plum Pudding, all from the Dotted Swiss Bazzill Range. 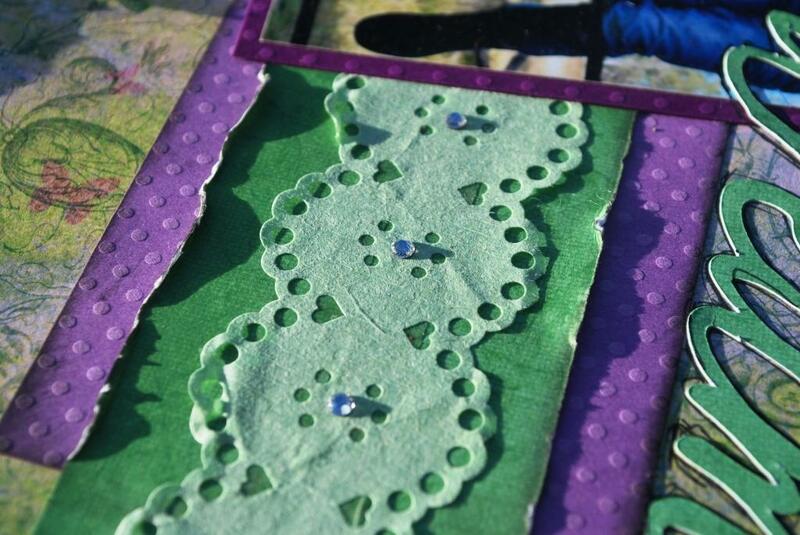 Here is a cute layout incorporating stitching using the Bazzill In Stitch'z Templates and Floss. Today we have a topiary made using Rose Creations. By altering the colours you could adapt this project for numerous occassions. Here is a beautiful wedding page. 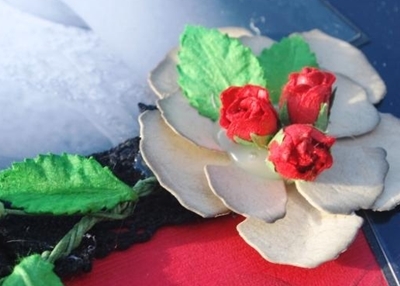 Kirsty has combined some little blossoms with the Rose Creations flowers to create some lovely floral embellishments. 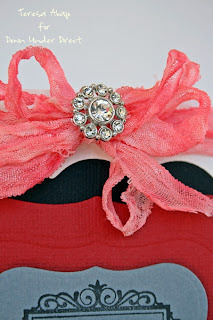 Lightly brushing the embossed side of the gorgeous Ruby Slippers Bazzill with ink will create the effect of patterned paper. 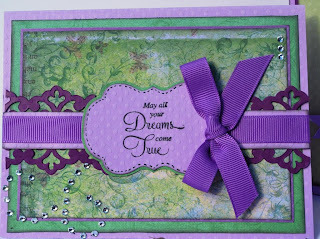 Here is a card I made using the technique from yesterday's tutorial. For my flower I added some stamens which have been coloured using Copics. 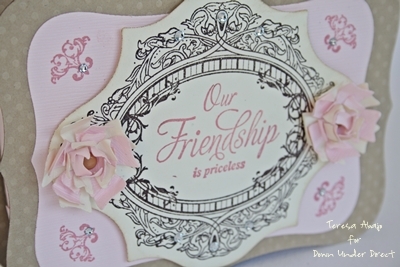 I also scrunched up the leaves to go with the vintage look of the flower. 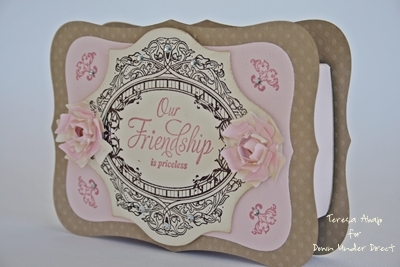 JB-09835 You're So Sweet Borders & Centres 2"